Posted October 6, 2018 @ 16:21:05 EDT. It occurs to me I have no idea what music is popular anymore. This has been a journey, of sorts, starting maybe ten or fifteen years ago, when I began exploring progressive rock and experimental music. I found a satisfaction in the sound, and at the same time it opened up a doorway to more. I enjoyed learning that this genre, which I had enjoyed quietly — privately — as a youth, actually had a name and a bit of a subculture and fanbase. And in this age of streaming services and YouTube and their ilk, not to mention a frighteningly growing artificial intelligence, you can queue algorithmically recommended songs similar to what you're listening to on an ever twisting and turning rabbit hole extending out into eternity. So I wonder if anyone else is going down this path, this winding path, out there. Or some similar path... regardless of the genre, or even the subject matter. There's enough intelligence on the web now that it can pretty accurately recommend what you might like next. And I'm not talking about the people on the internet... Jesus H. God, no. I'm talking about the stuff... the information. Do you like anything at all? Any particular kind of book, movie, music, media, artform, topic? Jump in anywhere, see you in a decade or two. It's all out there. And as we each get further down our own pathways, maybe despite how this may seem to expand our views, it could be doing the opposite by sending each of us down seven and a half billion unique rabbit holes, wending further and further away from the so-called mainstream. And then there is no more mainstream, and no way to get back to it or to any other pathway. Just each of us in our own private Idaho, advancing to the next turn in the road. This isn't a bad thing necessarily, but for those who champion the internet as a great equalizer, it may be worth considering that your head is down a rabbit hole somewhere too. It may be worth asking which one, and whether or not it's keeping you from looking around once in awhile at other things. Posted December 22, 2017 @ 17:01:52 EST. I got a new car. My old car was purchased shortly after 9/11 and it was a rather basic five-speed model with cruise control, air conditioning, and a CD player. Over the years I added a few minor upgrades to the vehicle as needed... such as a phone mount and a Bluetooth adapter for the stereo. The CD player quit working at some point, I don't recall when; but by the time it had, CDs were fairly obsolete anyway. The car suffered a mechanical failure a couple of weeks ago, mileage far into the six figures. Since the Blue Book value was way under what the repairs would have cost, I decided it was finally time to visit the car lot and make a big purchase. So my new car also has cruise control and air conditioning. There is no CD player, which is fine with me. It has Bluetooth built in, which is also fine, and a big cubby in the front where I can put my phone. There are also a lot of bells and whistles, things like cameras, GPS, automatic headlights, voice control (!!! ), separate temperature zones for the cabin, heated seats. It computes my gas mileage as I drive, has a couple of different display screens in the front, and can even pop up a notice near the speedometer when I get a text or have a turn coming up. It's an automatic, and I guess the word "automatic" is pretty all-encompassing as far as this vehicle goes. It doesn't even have a key... it detects my presence with a little transmitter thing, unlocks when I touch the door handle, and starts when I push a button. The model I got has the base package for its class (do I sound like a car commercial, or what?). There's an upgrade package available which adds even more bells and whistles to this already hefty collection. Among the upgrades are quite a few mechanisms for keeping you safe in a slightly more aggressive manner than you'd expect, such as "nudging" you back into the correct lane in case you drift a little, or "helping" you apply the brakes in case you're getting too close to an object in front of you, or "watching" the car in front of you while in cruise control and keeping up with it. For people who are a little nervous about vehicles which drive for you, this is probably how you'll get eased into the concept... small incremental improvements which make the driving process easier and easier, eventually reaching a point where you can just relax and enjoy the scenery. I've realized we're at a point where thinking of our vehicles as "cars" in the traditional sense is perhaps as obsolete as my old five-speed was. Instead, we maybe should see them as big mobile computers we can drive around in. That is... until they're driving us around instead. Posted September 17, 2017 @ 23:20:42 EDT. 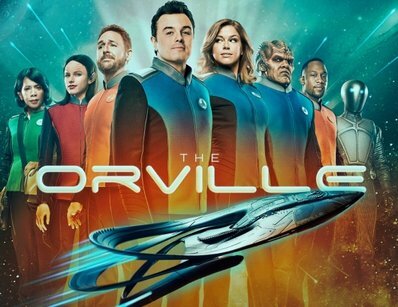 Just in case you're jonesing for a Star Trek fix before Star Trek: Discovery starts in a week or so, you'd do well to check out The Orville on Fox. It's not Trek, but it's a great show — in space, on a spaceship, with a crew that has fantastic chemistry — and there's enough familiarity to make any Trek fan feel right at home. It's getting panned by critics, and I somewhat expected this. It's being called bland, not funny, and rarely effective. I'm not sure what show these people were watching, but it wasn't The Orville. The show I watched was irreverent, funny, and well-executed — and with just enough nostalgia thrown in to pay proper respectful homage to a giant sci-fi series. Fox has already moved it from Sunday to Thursday, two episodes in. I'd like to think the network is making a smart move there, moving it out of the post-NFL game slot (where it would be subject to delays and such, as sports programming can be a bit unpredictable) and into a proper primetime slot... Thursday nights at 9:00, an esteemed place once occupied by shows like Cheers, Seinfeld, Frasier (all on "another network" as David Letterman once used to say). My assumption that Fox knows how to keep a sci-fi show alive could easily be wrong too. It is the same network that canceled Firefly, after all. As if we sci-fi folks would ever forget that, or forgive it. Anyway, check it out. And for the critics and haters, here's a quick checklist to get you up to speed. It's Seth MacFarlane. If you were expecting high drama or a documentary or something, you might want to review his other work. It's early. All sci-fi shows need at least a season, maybe a half season, to get their sea legs (or space legs, whatever). I think you could say that about most shows, really. It's called character development. This one has already got some pretty good chemistry if you'd pay attention. The audience loves it. Which of these is more likely... that you're wrong, or that all of us are? It's funny. Lighten up. Laugh a little! Damn. Posted August 24, 2017 @ 21:43:21 EDT. About 31 years ago, in October of 1986, I saw my first solar eclipse. I was in tenth grade. There had been one in 1984 also, but it happened in the middle of the school day — close to lunchtime — and I was inside. That day in 1984 was already cloudy and rainy and it just looked like a severe storm was moving in, the sky darkening outside the tall windows of the auditorium at my junior high school. The 1986 eclipse was a very strange one that kind of looped around the southeastern coast of Greenland for forty minutes. Not many people knew about it because it was a minor eclipse, not even total until two tenths of a second from the very end, and even then, just in Greenland. It was enough for me. The shadow of the moon swept across Canada and the United States, the partly covered sun's crescent gracing my October afternoon and filling my young mind with wonder and delight. And I looked forward to the next one, which I knew about thanks to a list I found in some reference book at the library. I also knew — yes, even that long ago — there would be an eclipse crossing the United States in 2017. And — yes, even then — I started making plans to see it. And I did see it. Everyone in the country did, in some form, with it being one of the big news items of the week. 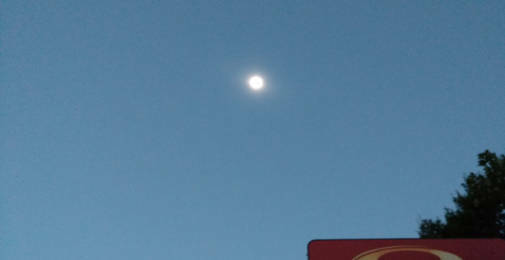 But with this one, I was outside, under a clear sky, in the path of totality for the first time. The words I know feel insufficient to describe this phenomenon in all its glory. From the moment of first contact all the way up to maybe half an hour before totality, there wasn't much to speak of, and in that sense, it wasn't too dissimilar from any of the numerous partial eclipses I've seen in my life. But from that point forward, things got simultaneously quiet, dim, and unsettled. The temperature dropped, the surroundings took on an orange hue, the shrinking sun losing its August intensity and wearing instead the frailty of December. Shadowy crescents danced in the shade of trees and the sky deepened through blue stretching toward cobalt. The light dimmed more and more, paler and paler as the sun vanished from the sky. 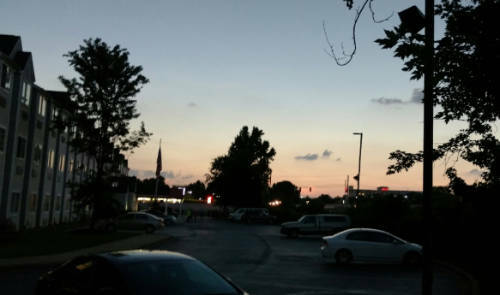 And finally, a very slim crescent, and then a thin line, and then a ghostly ring of fire in the sky with a dark gray hole in the center; sky the dark blue of eternal evening, and pink and orange sunset dislocated around the entire horizon, no way to tell where to find west or east or even north. Totality. Streetlights winked on and katydids chirped in confusion, birds flew around in lost winding circles. Somewhere, someone set off fireworks. They were unnecessary — the spectacle was in the sky. Two short minutes later, a thin blinding line appeared in the sky again, and the light returned as quickly as it vanished. August resumed, the dim pall of the moon retreated, and within a couple of hours, it was as if nothing had even happened. I tried to get a picture of the eclipsed sun, but with my only available camera being my Motorola phone (plus the fact that my photography skills are about as good as my basketball skills), I'm almost ashamed to post it here. But I will anyway. Meanwhile, this is closer to what I actually saw. Best leave the photos to the professionals, I guess. This was a spectacular event, and with the next one in 2024, I am — of course — already making plans for it. If, for whatever reason, you didn't (or couldn't) see totality, it's really worth the trip to see it. The good news is the 2024 eclipse passes a lot closer to me, and it's going to last twice as long. Who knows... maybe I'll even pick up a photography class or two in the next seven years. Posted August 19, 2017 @ 00:02:54 EDT. This is a pretty cool video I found at kottke.org, one of my all-time favorite sites where you can find cool things. Basically, it's an automatic hammer powered by water and made from the very stuff of the earth: wood, twine made from viny plants, stone. The notes for this video indicate the hammer falls at a rate of once about every ten seconds. It might not sound like you can get any useful work out of that, but that belief likely comes from the more traditional, "modern" view of hammering something, which is to beat the hell out of it at a very rapid clip. That does indeed get the work done, but you end up with a sore arm and maybe some recuperation time depending on the job. Instead, consider this: as long as that little stream of water is running and nothing breaks, this hammer will run continuously, day and night, day after day after week after month. It may not have the precision needed to hang up a picture, but this hammer isn't built for precision. It's built for consistent and relentless force applied over and over and over again. If you need to grind some corn into meal or pulverize some rock into fine powder, this does the trick quite nicely. My favorite part of the video is when he watches the hammer working for a bit and then walks away from it. It keeps on working while he's away doing something else. I can imagine the odd feeling coming over the first primitive man who built a contraption like this once he realized he could leave the machine alone, working unsupervised, while he tended to another task, like checking the rabbit traps or painting a bison on the wall of a cave or something. We realize gains in efficiency when we automate certain portions of our lives. Monthly bills, for example, one of my favorite examples. I discussed this one pretty recently. All my monthly bills are as automated as possible so I can do other things (like check the rabbit traps). Amazon has warehouses full of robots which move goods from one end to the other in an orchestrated ballet of logistics... and you'd better believe if there's any one company on this planet squeezing as much efficiency out of its operation as possible, it's Amazon. Another thing to learn here is that small consistent actions, over time, can make a big difference. One hammer drop every ten seconds over a 24-hour period gives us 8640 hits from the hammer. I'm no expert, but I'd say I personally can hit a hammer about twice a second. I'd have to go at it for an hour and 12 minutes without a break to match this machine... and I'm pretty sure I'd be too tired to continue after much less time than that (and likely would be too sore to attempt it again the next day). The machine could go for another three days or three weeks with no problem, working at only 5% my speed. Those little things add up. Sometimes when we think they're not making a difference, they really are, and sometimes, they're the only things that are. Little by little, bit by bit... and that unrelenting persistence gets the job done as well as a quick burst of activity. Never give up. Posted July 29, 2017 @ 09:19:50 EDT. Coke Zero is being discontinued. Further, it's being replaced with a brand-new formula. Well great Scott, Marty, this sounds oddly familiar. I don't drink a lot of carbonated beverages anymore myself, opting instead for tea or water. Coffee in the morning, of course, black — and slightly less viscuous than Valvoline 10W-30. Anyway, my point is the Great Coke Switcheroo Part II won't affect me much. But there are people who are really passionate about this. I get that... and given Coke's extremely similar tactic and its spectacular failure about thirty years ago, one would think they'd have learned from it and not tried to make the same mistake again. Well, let's look at that a bit. 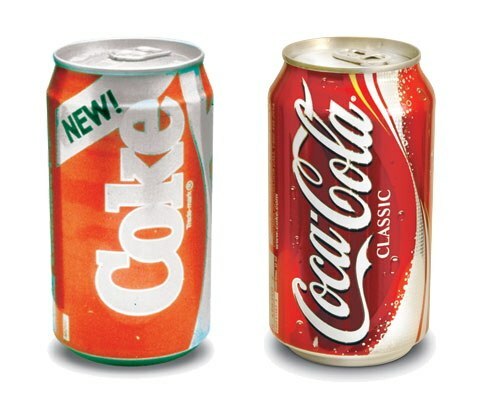 I was a mere youngster when the New Coke fiasco took place, and for awhile I had an actual can of the original Coke and the supposedly identical Coke Classic. Despite claims to the contrary, the ingredients were different. The biggest change was the substitution of high fructose corn syrup for sugar. Let's not be naive here — when the second-largest ingredient in your product is swapped for a completely different ingredient, two things are absolutely going to change: the flavor and the manufacturing cost. Coca-Cola has been around for a long time, and you could argue they are one of the most successful marketers ever. The red can with its white swoosh thing (or "dynamic ribbon device" as they call it) is an iconic symbol recognized all over the globe. Given that, it would be extremely foolhardy to change what works, whether taste or appearance. But in 1985, they did just that. Why? Hint: high fructose corn syrup is very inexpensive when compared to sugar. So for the 1985 change, I'd say it's as simple as following the money. As for changing Coke Zero to Coke Zero Sugar, the new name of the soda, there's no sugar to remove (zero sugar — get it? ), so it's not that. Maybe some other ingredient has become too expensive and the profits aren't what they once were. Maybe there are too many people like me who have steered away from carbonated beverages as a whole. I don't know. But I'll probably get a can just to see what all the fuss is about. Maybe that's the game... getting people to just try it again. That's not good in the long-term, but it creates buzz in a mature industry... and if that's the goal, they've definitely succeeded.